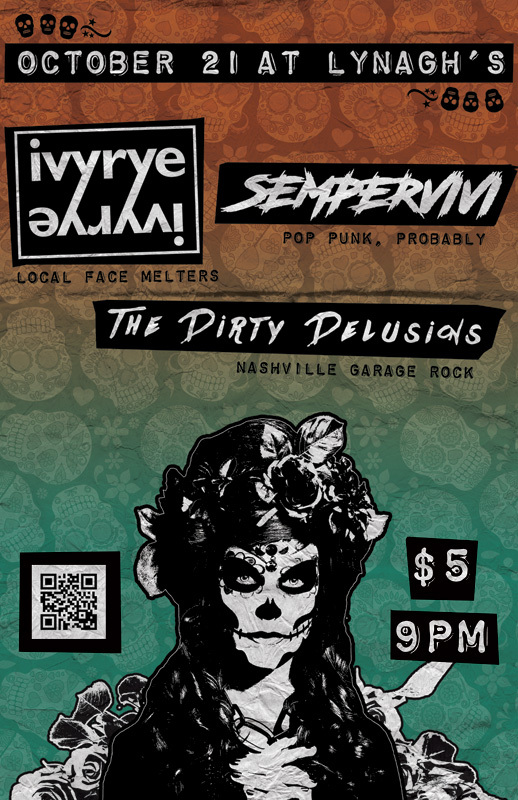 Garage rockers The Dirty Delusions brought their stunning live show to Lexington on tour in October 2018. Their management tapped my band Sempervivi to open, and also employed me as the concert flyer designer. The event was close to both Halloween and Day of the the Dead. Therefore, I decided on a spooky theme for the 11×17″ poster. Let’s face it. Skulls are awesome. We all have one. They just look cool! Since Mexico’s Day of the Dead was just days away, I employed a stock photo of a woman in costume with a skull face paint design. Then, I added more roses around her to add more weight to the image. I simplified the photo to high contrast black and white and overlaid a scan of some crinkled paper. This gave it the appearance of a rough photocopy. Next, it was time to add information about the event. I rounded up each of the bands’ logos. Most of the time, I do not incorporate band logos, but thought doing so would help this design stand out. I “cut out” rough black rectangles as backgrounds to imitate patches with said logos. To complete the DIY punk rock feel, I set the rest of the text in a “label maker” style font on additional simulated cut outs. I then added sugar skull ornaments to help emphasize the date and location at the top. The QR code let anyone with a smartphone access the Facebook event to learn more and RSVP. Finally, the background incorporates a green to orange gradient to imitate vintage concert posters. I blended in a seamless black and white sugar skull pattern to complete the theme. An eye catching poster makes a huge difference in audience perception. 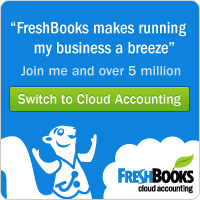 Do you want look more professional, as well as draw more fans to your shows? Of course you do! Contact me today. 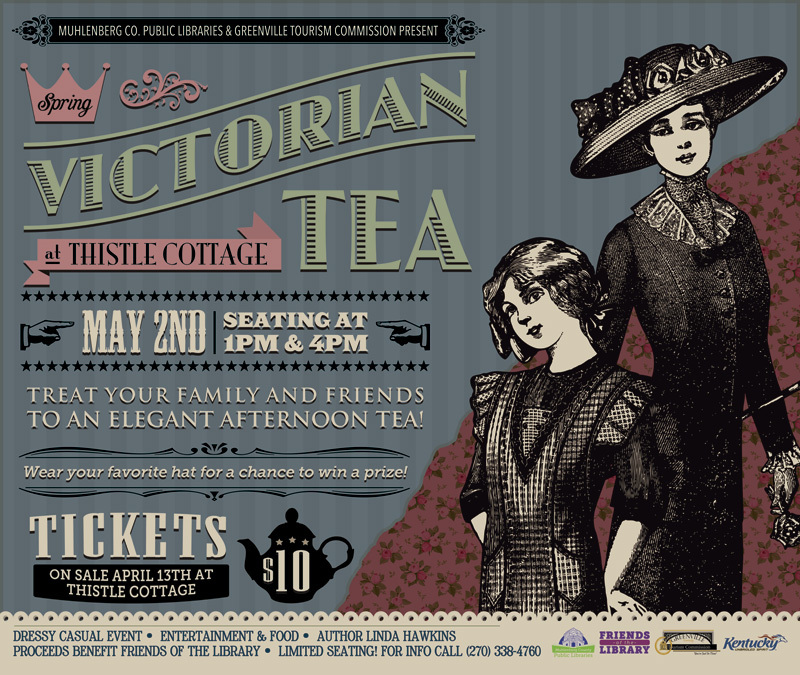 For the second year running, MCPL once again hired me to make their annual Victorian Tea poster design. I started by laying this design out in kiosk size. Then, I resized the art into several smaller formats. Half page newspaper ads were the smallest size. Thistle Cottage holds their annual Victorian Tea in downtown Greenville, Kentucky. The party is a Victorian themed event where Mothers and daughters dress up and enjoy a traditional tea party. It is a popular event where both mothers and daughters can go back to experience a simpler time in history that their ancestors once knew. The air of nostalgia brings little girls’ tea parties to life. Servers and staff also dress in period attire. An elegant event such as this called for an equally classy poster design. I really enjoy sifting through vintage Victorian ads. Obviously, I patterned this poster design after them. I started with the featured black and white illustration of the mother and daughter characters. The poster’s background is dressed in a “shabby chic wallpaper” pattern with the drab colors that were fashionable in that era. My favorite feature of any good Victorian ad is the variety of fonts and dingbats in use. Artists seem to always use a dozen fonts in any given piece. It looks like the advertiser aimed to use as many fonts as possible in one space. These warped font styles often remind me of the circus. It’s as if the carnival barker pulled double duty and was also hired to design the poster layout. Both the teapot and pointing finger ornaments give the composition an old time “over the top” feel. Step right up! Are you hosting a retro event? Contact me today for your own poster design!